A double recipe day. I baked these amazing bars a few months ago but never shared the recipe. Since it’s a rainy kind of day I thought it would be a good day to share. 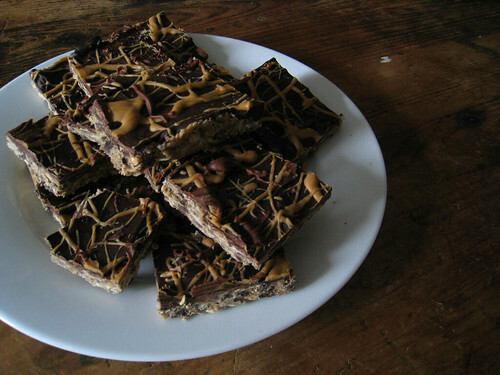 No-bake Peanut Butter Chocolate bars are super easy to make and taste insanely good. I probably ate the whole pan. I couldn’t help it peanut butter/chocolate is my favorite combo. I would suggest cutting the bars a bit smaller then me. The bars are a little rich. Enjoy! Man, these look delish. I <3 peanut butter and chocolate (which in australia is an usual combination) and any excuse to combine the 2 is a good one! ohhh man, these look dangerously delicious! Best combo in the whole wide world. This recipe looks amazing. Thanks so much for sharing! Ha Rachel! Maybe if you hide half the pan? Oh god. Does cutting it into smaller pieces help out if you eat the whole pan? I think it would at least make me feel better about myself. This one is going on my list.